Sunday Scribblings #22 - "The Monster..."
Inspired by one of my favorite childhood books, this week's prompt is: "The Monster..." (and you finish it as you are inspired to do.) Will it be the monster under your bed, the one under your child's bed, or the monster that was your grade three teacher? You could write about your favorite monster costume, a monster in your past, your favorite Muppet, your strange and scary pet, or the big shark that you met scuba diving off the coast of somewhere strange. I realize that this prompt could also open up some dark scary places in your past or present life. Whatever monster you choose to write about, be brave. As with many things, monsters come in all sizes and shapes, but as this little book shows us - sometimes the monsters we believe in are scarier than the ones that are actually there. AS ALWAYS - PLEASE add your permalink in your comments. Look at previous prompts to see how to do this. Here is mine ... a "Monster" in my life ... "the wrong job!" Just a fun spin on the theme! I have written mine too. By the way, that was one of my favorite books as a little girl and as and adult now too. My story about our encounter with a monster -- of sorts -- is here. Hope you enjoy it - this being the first time that I've ever written anything without being emotionally charged to so . . . .
Hope everyone sleeps well tonight! I have an ugly monster lurking in my backyard. I work for a monster. Haven't participated in a long time, but was inspired by this week's topic. Yes...another week....and I am still playing!!! Hm...as much as I don't like the road this took me down, I'm glad this prompt came up. Helped me with a conversation I had to have. The monster? A lack of a goal! Blogger has been a beast today. I hope I did the linky right, I'm hopeless at this! Here's mine for this week. I have to admit, only the first paragraphy applies, but here it is. Yikes. I didn't know if I would do this one. I'm posting now because I really want to read the other pieces, and I don't let myself until I've posted something. So this is what my monster made me write. I'm back! Here's my post for this week! Here's mine. Thanks again for the great prompt! Her's mine, the hidden stress monster in me. What a fun idea! I stumbled upon this site via Yahoo's financial news today about Blogging. My entry is another childhood memory. Wow, all kinds of Monsters out there. Good subject. Thanks. Hi, I'm late tonight... sorry...I'll have to read tomorrow. Happy Sunday! Ah the bizarre childhood memories. The monsters live!!! I'm definitely glad I found this journal! thanks for another great question! mine is up - the monster in my stomach. Here is mine again, I think it got missed the first go round. Thanks! Here's mine - very late and very silly. I have been following the Sunday Scribblings for a while now and this is my first post to it. Oh, I'm late. Here's my beast. think I got skipped....though that may be a good thing lol. New to Sunday scribblings! Wonderful exercise! ps- I love that book!!! I am really late! But it was fun!!! Sorry it's soooo late. This topic gave me fits. 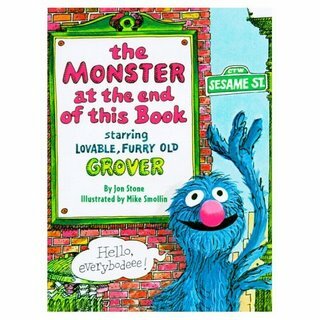 "The Monster at the End of this Book" was one of my most favorite books ever as a child. Seeing it posted here made me finally decide to take part last Sunday, but was too scared to post what I wrote. Was still too nervous to join in. Thanks for giving me a reason to write. New here, looks like fun. I just got some new stuff, a 5G iPod Nano, a Plantronics Discovery 975 , and a Seagate FreeAgent DockStar! The first part of unlock iphone starting any new site is picking the niche you want it to be in hotel marrakech. My biggest criteria for this case study was finding a niche that should be fairly easy to get some traction in rapidleech servers, so I went for something pretty obscure pnr status. I don’t know how much money is here, so I’m taking a chance there scrapebox. But all techniques stay the same adwords coupon. #19 - "Who else might I have been?" Sunday Scribblings #16: "With Baggage"
Sunday Scribblings #14 - "Two peas in a pod"